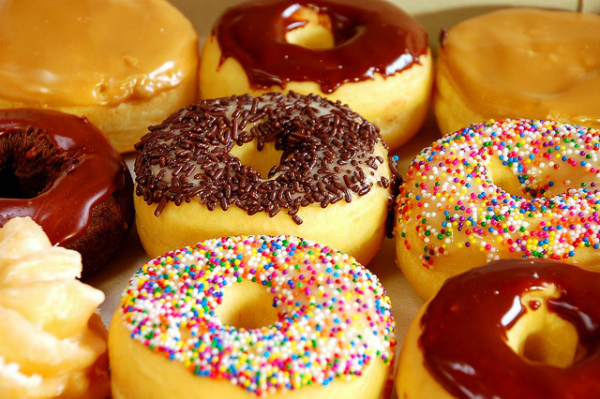 For some people who sport their sweet tooth with pride, donuts happen to be little drops of sweet indulgence that may have rained from heaven. Somehow, no amount seems big enough while you are gorging on these sugary delights even if your body screams for immediate attention to curb the floodgates of calories. As far as facts go, simple sugar donuts amounting to 100gms, which is a quantity that may not even wet your tooth, counts up to 425 calories. If you eat two of them with you morning coffee / tea, 850 calories it is. The mathematics is simple, comprehensive and often very threatening. • Stop buying start making – This is one of the best ways to keep the contents in check and be free of the saturated additives that are found in market-made products. When you make donuts on your own, try to keep the size smaller than the usual. This will go a long way to bring down the calorie count. • Don’t fry, bake instead – The usual donut recipes involve deep frying. However, you are sure to get better results if you bake the dough instead. The recipes that allow baking consistency in the dough are almost the same as the dough that is fried and yield similar and often better tastes. • Go for wholegrain not refined flour – Wholegrain flour in the dough will cut down calories by as much as 40% or more. At the same time, you will also get a healthy dose of fiber in your donut which could actually make it breakfast worthy. • Choose low calorie sugar – Be it in the frosting or the body of the dough; opt for low calorie diet sugar in place of the usual refined sugar. At the same time, if you choose to cut down the total sugar input by 25% or 50%, you may have a donut that is less sweet but something completely guilt-free. • Try out healthier recipes – Cinnamon – almond – gluten-free donuts, pumpkin – banana – yogurt – flax donuts… the options are plenty and worth every attempt made towards it. As you increase the inputs of healthy ingredients, the calorie count is sure to decrease. To sum it up, you can eat donuts by ditching calories when you start ‘baking’ them at home using diet compatible sugar at lesser content, with wholegrain substitute for the dough and with a dose of healthy inputs like certain fruits and nuts. So go right ahead and enjoy a whole new world of diet friendly donuts that will pose negligible threat to your health or shape.